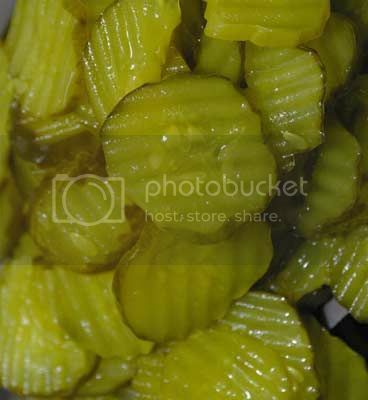 I absolutely love pickles. I have since the day I was born. 4 years ago a few weeks before I got married my Aunt Cathy gave Lindsey and I my Grandma's pickle recipe. Since then I have been making pickles. To me this has to be the best recipe in the world and the hotter the better. Some say I should just sell them year round but man I would have to make gallons of pickles. So come Friday I will be picking up 3 bags of pickling cucumbers to make into pickles on Saturday. I am so excited and in 6 weeks I will be cracking open a jar of new pickles. Oh I can't wait. Man those pickles were good four yrs ago. I think you had Olivia with you one day while you were making them. MMMM they were good! I think I did. That is funny!! I love you and miss you!!! We should share our pickle recipes with each other and see what the differences are... I would be curious.